A redox activated vase-to-kite conformational change is reported for a new resorcinarene-based cavitand appended with four quinoxaline-fused thianthrene units. In its neutral state, the thianthrene-containing cavitand was shown by 1H NMR to adopt a closed vase conformation. 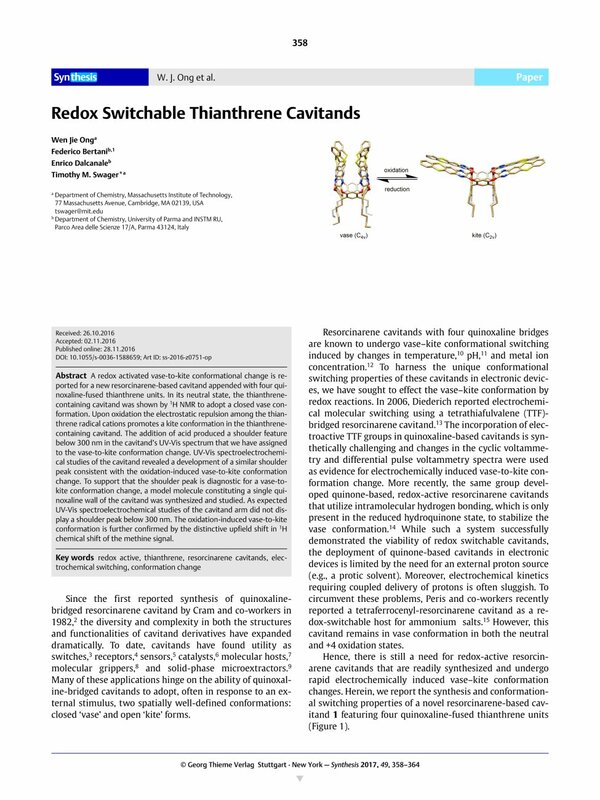 Upon oxidation the electrostatic repulsion among the thianthrene radical cations promotes a kite conformation in the thianthrene-containing cavitand. The addition of acid produced a shoulder feature below 300 nm in the cavitand’s UV-Vis spectrum that we have assigned to the vase-to-kite conformation change. UV-Vis spectroelectrochemical studies of the cavitand revealed a development of a similar shoulder peak consistent with the oxidation-induced vase-to-kite conformation change. To support that the shoulder peak is diagnostic for a vase-to-kite conformation change, a model molecule constituting a single quinoxaline wall of the cavitand was synthesized and studied. As expected UV-Vis spectroelectrochemical studies of the cavitand arm did not display a shoulder peak below 300 nm. The oxidation-induced vase-to-kite conformation is further confirmed by the distinctive upfield shift in 1H chemical shift of the methine signal. Supporting information for this article is available online at http://dx.doi.org/10.1055/s-0036-1588659. 1 New address: F. Bertani, School of Chemistry, University of Tokyo, Department of Applied Chemistry, Japan.